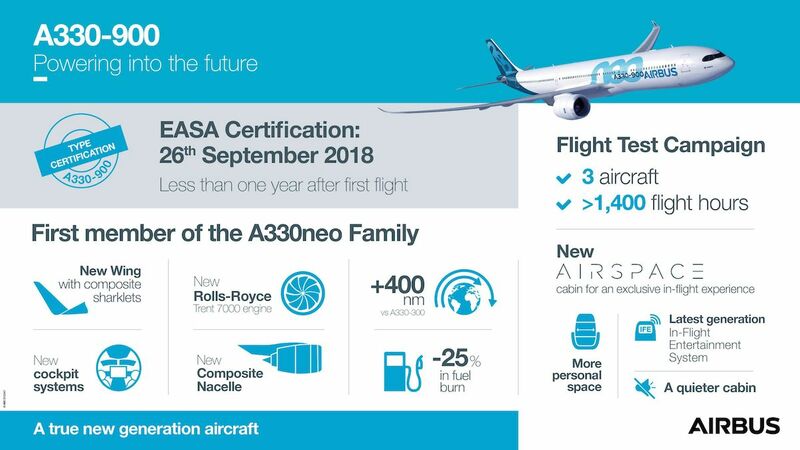 The A330-900 has received its Type Certification from the European Aviation Safety Agency (EASA). The aircraft is powered by Rolls-Royce Trent 7000 engines. The Type Certificate was signed by EASA’s Certification Director, Trevor Woods, and handed over by EASA’s Head of Large Aeroplanes Certification, Ludovic Aron, to Airbus’ Head of Engineering for Commercial Aircraft, Jean-Brice Dumont. Federal Aviation Administration (FAA) certification is expected to follow shortly. In agreement with TAP Air Portugal, its first built aircraft served as a demonstrator for route proving around the world visiting more than 12 countries. Together with the two A330-900 flight test aircraft, the certification flight test campaign was successfully completed in around 1,400 flight test hours in under a year since the first flight on 19th October 2017.